There are several Coffee Mugs to choose from. Every one is decorated with a theme from the Hit TV Show Breaking Bad. 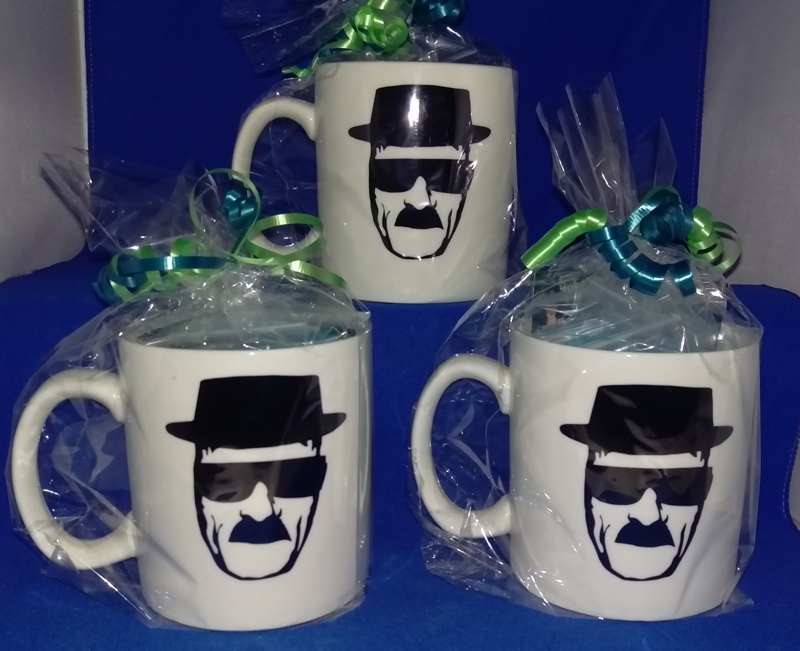 Our Heisenberg Profile and five options from the Tom Lamb Collection are the current options. Shot Glasses should should be hand washed only. Every Glassware comes with five “dime bags” of Breaking Bad Candy. These have been a favorite at Comic Cons in Albuquerque and Breaking Bad Tour Participants. Show them off in glassware bar or Use them as your daily use. Either way it will become a conversational piece. Some Product Variation is Normal! The Candy lady does not endorse recreational and illegal drug use. Here we encourage people to use the show’s popularity and events to teach others about the Real Consequences, Life Cost and Danger of “Meth” and other illicit drug use. *The Actual Item May Differ Slightly From That Shown In The Image. The images used for for these items are considered Fan art aka fanart. (Artworks created by fans of a work of fiction) No copyright is infringed Breaking Bad is the official property AMC Network Entertainment LLC.